Devaraj Parasannanavar has done M.Sc in Microbiology from Kuvempu University, Karnataka and Ph.D in Applied Biology from University of Mumbai, Maharashtra. Currently working as Scientist C’ in Division of Clinical Epidemiology, National Institute of Nutrition, Hyderabad. He has been recognized as Ph.D supervisor in Microbiology subject by Osmania University, Hyderabad. His research area includes Nutrition Immunology, Clinical Microbiology and Immunogenetics. He is currently working on role of genetic variants and gut microbiota in iron deficiency anemia in adolescent girls. He is leading a project entitled’ Correlation of Prakriti(Ayurgenomics) with HLA-DRB1 gene, dietary pattern and gut microbiome in Rheumatoid Arthritis patients in collaboration with Nizam’s Institute of Medical Sciences, Hyderabad and Dr. B.R. K.R Ayurveda Medical College Hyderabad. He is involved in a Clinical trial on “Effect of Probiotics and DHA on cognition, concentration, Memory in children 7-13 years” as a Principle Investigator. 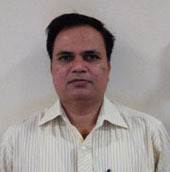 He has published more than 20 research papers in reputed international journals. Shankar kumar, U. Pawar A., Gaonkar, P., Devraj, P. and Ghosh, K. HLA allele associations in idiopathic recurrent spontaneous abortion patients from India. J. Reprod.Sci.2008;19-24. Shankarkumar U. Deepak G, Devaraj JP,Aruna P, Uday K. Ghosh,K. HLA-A and HLA-B alleles association Among Psoriasis patients from Mumbai. Indian Jour.Dermat 2011: 56(5):497-500. Umapathy S, Devaraj J P,Kanjaksha G. HLA-B*07 Alleles in B27 Negative Spondarthritides Patients from Mumbai, Western India. The IUP Journal of Genetics & Evolution: 2011:3:7-14. Vandana Pradhan ,Devraj.J.P Heba Dalvi,. Rajadhyaksha.A, Manisha P, Ghosh K.
Study of PTPN22 1858C/T polymorphism in rheumatoid arthritis patients from Western India: Indian Journal of Rheumatology: 2012;7(3):130-34. Devraj.J.P. Yeola A., Pradhan V. Rajadhyaksha.A*, Ghosh K., HLA-DRβ1*04 typing by Simple in-house PCR-SSP technique for Rheumatoid Arthritis patients. Rheumatology International: 2013:33(4): 867-870. Devraj.J.P. Yeola A., Pradhan V. Manisha P,Rajadhyaksha.A, Ghosh K Distribution of HLA-DRβ1alleles among well characterized Rheumatoid Arthritis patients from Western India. Rheumatology International. 34 (5), 705-708. Manoj Kumar, R. Hemalatha, Rajesh Kumar , Ravinder N, J.P. Devraj and et al Epigenetics, Probiotic Metabolites and Colon Cancer Prevention: An Overview of Progress, Opportunities and Challenges. Medical Epigenet 2013;1:60–69. Manoj Kumar, R. Hemalatha, Ravender Nagapal, Birbal Sing, Devaraj Parasannavar, V. Verma et al Probiotic approaches for targeting inflammatory bowel disease: An update on advances and opportunities in managing the disease. Intl. Jr. of Probiotics and Prebiotics. Vol.11, No.3/4, 2016. Mamidi RS. Hemalatha R, Anchoju VC, Donugama V, Nallagatla H, Parasannanavar D, Madabushi S, Bhukya T Maternal Vitamin D status and neonatal outcomes among apparently normal pregnant women in South India. Jr. of Obstetrics and Gynecology of India. Ind Journal of Paediatrician-2017 doi: 10.1007/s12098-017-2508-9. M Kumar, V Verma,R Hemalatha., Devraj P.,Singh M.P Targetting signaling pathways to eliminate cancer stem cells. In Stem Cells from Culture Dish to Clinic: Edited by Vinod Verma et al Publisher; Nova Biomedical New York.2018. V Verma.,A Mukherjee.,N Tabassum.,C B Yadav.,A Singh.,M Kumar.,A Kumar., Devraj P Cord blood banking : Hope vs Hype. In Stem Cells from Culture Dish to Clinic: Edited by Vinod Verma et al Publisher; Nova Biomedical New York.2018. Himaja N. Devraj JP, Hemalatha R.,M Kumar Food Borne Diseases and Food Safety Issues. In Recent Trends and Advances in Environmental Health- Edited by R R Tiwari and Manoj Kumar Publisher; Nova Biomedical New York.2018. Travel grant award to participate and present paper at 1st Meeting of Asian-Pacific federation of Inflammation and Regeneration: APFIR 2011 and 32nd Annual Meeting of the Japanese Society of Inflammation and Regeneration: JSIR 2011 which was held on June 2-3, 2011 at Kyoto, Japan. Received MASHAV fellowship Post graduate Diploma in Nutrition course held at The Robert H smith Faculty of Agriculture, Food & Environment, The Hebrew university of Jerusalem, Israel during 28th Aug -20th Sept, 2017.